The most prevalent childhood mental health disorder in Canada, Attention Deficit Hyperactivity Disorder,(ADHD), sometimes called Attention Deficit Disorder (ADD), affects one million children in this country alone. Medication is the most common treatment for this illness, but it is accompanied by potentially dangerous or deadly side effects. Understandably, many parents are looking for alternative or complimentary treatments. One emerging approach is music lessons. Studies suggest that learning music improves ability to focus, increases self-confidence and improves certain brain functions. Benefits like these help children develop more positive patterns of thought and behavior that can stay with them throughout their lives. While juries are still out on the actual causes, ADD is known to be a biological disorder that is typically characterized by three main symptoms: hyperactivity, inattention, and impulsiveness. Mental health experts suggest that the illness may be the result of a delayed rate of maturation in the brain, particularly the cortex. Children with ADHD often grow up with difficulty learning, concentrating, and sticking to difficult tasks. This often results in, or is the result of, low self-esteem. Fortunately, music lessons help to increase concentration, improve brain function, boost self-confidence and teach perseverance. When you put a child with ADD in group classes like dance,the teacher has to divide their attention, making it easier for students to mentally drift. With music lessons, kids are learning something they love one-to-one with their teacher. This holds their attention and helps teach them to stay on track. Students of piano, guitar and other complex instruments will gain the most ability to focus. Yes, they might storm out of the room in frustration, just shy of throwing their guitar across the room, but they will come back to it. Music lessons teach children that it might take a while to get what they want, but they can only get there with patience. Researchers have discovered that the neurotransmitter dopamine is abnormally low in patients with ADD. However, dopamine levels can be improved when a person accomplishes something that feels significant to them, like learning how to play scales on the piano. Since dopamine helps regulate emotional responses and reward centers, any increase is particularly beneficial for these children. Newer research from 2016 shows music lessons increase brain fiber connections in children, including the frontal cortex which is typically underdeveloped in children with autism and ADHD. Learning music is both a creative outlet and an opportunity for kids to learn a language, improve their math skills, and make music happen. The achievements they earn through the process feel astounding to them, which raises their sense of self worth. Research suggests that increased self-esteem helps reduce behavior problems associated with ADHD. Researchers in San Diego have recently found that music lessons can have a positive impact on cognitive function and attention span. It may seem surprising, but those guitar lessons may actually enhance your child’s academic performance. ADHD can impact learning to various degrees. This means you will likely need to tailor your approach significantly. With limited attention spans, these kids require lessons that are more lively than the average student. As a teacher, you can help the student set goals that are both positive and specific. For example, set a goal like “practice piano twenty minutes per day, five days per week” instead of “stop playing so slow.” Providing praise and trinkets, like stickers or pencils, is a great way to reward the student for meeting those goals and will go far in raising their self-confidence. However, giving candy as a reward is discouraged since sugar is a known trigger for ADHD symptoms. Lastly, you can help your students immensely simply by working with their limitations and not underestimating these typically bright kids. Parents can support their child’s music education by providing the same support they would for school. One of the best ways to do this is to speak to the teacher and let them know that your child has ADD. Explain how the disorder impacts your child and their learning style so the teacher can prepare accordingly. At home, encourage your child to practice with structure. Create a consistent time and assign a space that is free of distractions. Practicing guitar is much easier without the television or conversations happening near by. Finally, remember that for children with ADHD, music lessons can be challenging. Sometimes it is a huge victory just to get your child to sit down at the piano. Praise and rewards go a long way towards encouraging them to stick with their lessons. 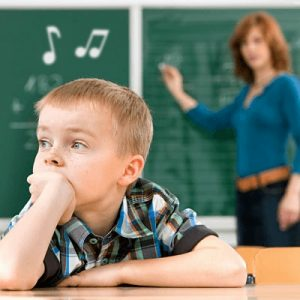 The jury may still be out on what exactly causes Attention Deficit Hyperactivity Disorder, but it is clear that the benefits gained from guiding your child through music lessons can last a lifetime. It can even help to positively alter their brain chemistry and neuroconnectivity, setting them up for success well into their adult life. BBC Magazine, The Power of Art: Can music help treat children with attention disorders?